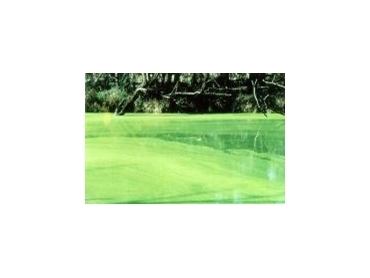 Toxic algae like Blue Green Algae (above) making effective algicide treatments like Coptrol from Rural Chemical Industries (Aust) essential for crop and stock protection. Coptrol is a new generation algicide created by RCI - Rural Chemical Industries (Aust.) Pty Ltd . It is a water-soluble chelated copper compound in which the copper is held so tightly it cannot be "stolen" by contact with other substances. It uses special organic chelating agents resulting in a uniquely effective algicidal action. Ornamental ponds and Golf courses, Stations & Mining operations, Sewage treatment works, Household water supplies, Farm dams & Stock troughs, Rice crops, Aquaculture, Swimming pools. The Coptrol algicide is specifically designed for safe and effective use in rural industry and for human and livestock drinking water supplies. It works in all kinds of water, hard or soft, salt or fresh, turbid or clear. It will clear up existing algae and prevent future growth, keeping water clear and bright. Coptrol is manufactured in Australia, where constant testing and development is a continuous process. Algae are a diverse group of simple, plantlike organisms. The algae in freshwater do not generally present problems. Indeed, algae are the most important photosynthesizing organisms on Earth. They capture more of the sun's energy and produce more oxygen than all plants combined. However, floating algal masses can smother rice crops and prevent young plants from emerging. Water flow can be severely impeded, they may block pipes, siphon tubes, irrigation channels and pumps. Coptrol algicide is easy to apply. Once diluted it can be applied from aircraft, from boats or pontoons, from the banks of smaller storages or even dripped directly into flowing water in high volume treatments such as flood irrigation. Since Coptrol is a non-corrosive liquid it is extremely adaptable in application. Unlike bluestone it can be applied as a Preventive treatment prior to or immediately after sowing. It can ‘piggyback’ on herbicide and insecticides flown on to aerially sown and drill sown crops, be mixed with water and dripped in to water flowing into bays and be poured from banks directly into flooded bays.